One of the gifts of interviewing people is that I get to meet some amazing people. Some of them are well known; some are not. Then there are those who will be famous, given enough time for word to get out. 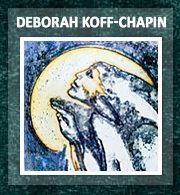 Deborah Koff-Chapin is one of those people. While knowing that I wasn’t just doing it for myself, I also realized that I was doing it for personal survival. It was a time when I had no support structure- – not even the understanding of friends. 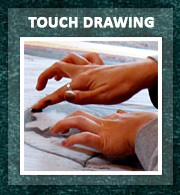 Touch Drawing was my thread through that time. Even when I felt crazy or in pain, drawing helped me access a stable place within. In giving form to my feelings, no matter what they were, they became externalized and somehow redeemed. What I eventually realized was that I was not only creating images; I was sculpting my own self. I haven’t stopped since. Cat: I’ve used my elbows to do Touch Drawing – and sometimes my feet! Deborah: Yes. Many people approach me and say, “Oh, I have this idea and I’m going to publish it myself!” I can tell who’s really serious when I throw out a few things about how much I’ve spent. It’s at least in the multiple tens of thousands of dollars – like $40,000-$60,000 to launch a project. 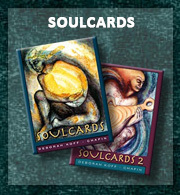 Deborah Koff-Chapin is the creator of SoulCards and SoulCards 2, available at bookstores or <http://www.touchdrawing.com/>. 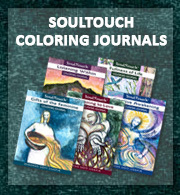 Cat Saunders, Ph.D., is the author of Dr. Cat’s Helping Handbook, available at bookstores or <http://www.drcat.org/>. This interview originally appeared in the October 2000 issue of The New Times, published in Seattle, Washington. It appears here with permission.